The 2012 special collector's edition, Silver & Gold is now available! 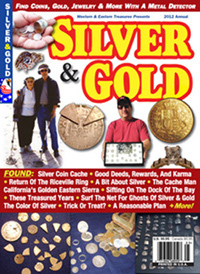 Articles Include: Silver Coin Cache; Good Deeds, Rewards, And Karma; Return Of The Riceville Ring; A Bit About Silver; The Cache Man; California’s Golden Eastern Sierra; Sifting On The Dock Of The Bay; These Treasured Years; Surf The Net For Ghosts Of Silver & Gold; The Color Of Silver; Trick Or Treat? ; A Reasonable Plan + More!